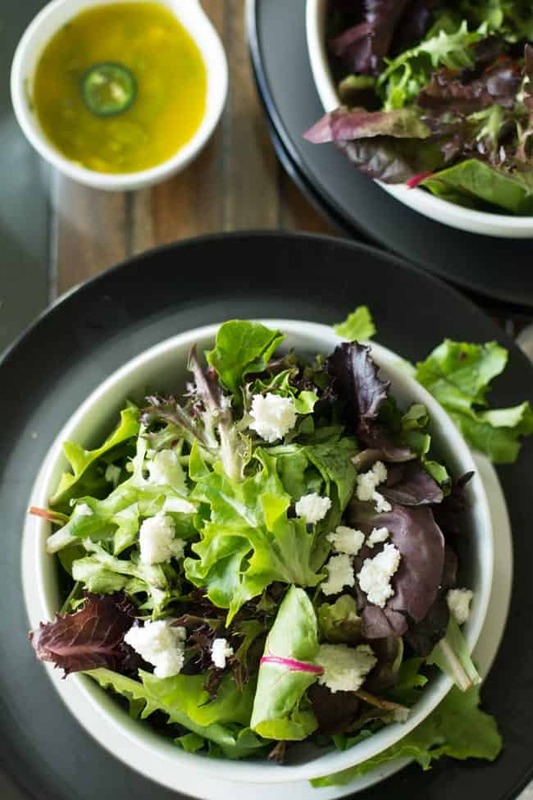 Fresco salad is a Mexican style fresh salad made with fresh spring mix, Queso fresco(Mexican cheese), and with mustard vinaigrette. This mustard vinaigrette is fiery and balances the crispiness of the spring mixes and your main dish. This Fresco Salad is additive salad which you would not keep your salad down after tasting it. I thought this salad would be the best recipe to share and to make in this season. This salad would be a little treat to yourself after a long tiring day. Every scoop of this salad energizes the body and satisfies your taste buds. Very easy to make salad, where you need to stress yourself for the preparation. The vinaigrette is the only thing needed to be prepared. 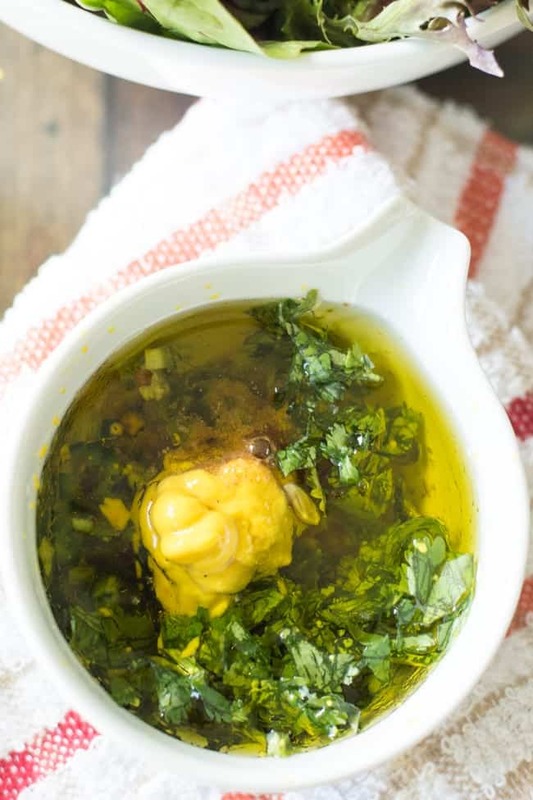 O the brighter side this vinaigrette can be made well in advance. Fresco salad is colorful and power pack dish which will be loved by all. A perfect dish to pair grilled meat, or barbecues. And a easy to make for potlucks or lazy weeknight dinners. 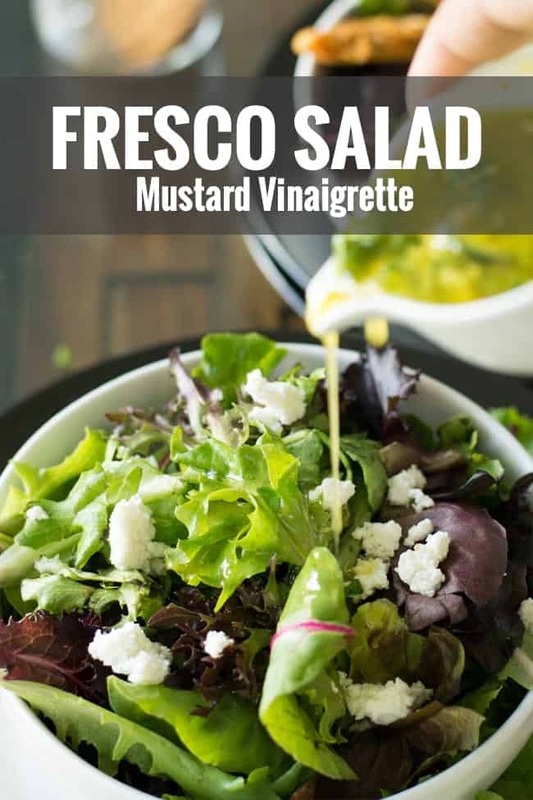 With little efforts, you can still impress the family with fresco salad with tasty mustard vinaigrette. Fall is nearing and we slowly shutting down the outdoor cooking. So it is wiser to try out all the favorite recipes before the season goes off. Till now we are getting a good quality of crispy spring mixes. Guessing that you will also be loving and make this before the winter starts. 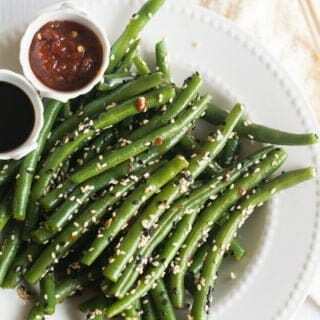 This is the next recipe in the series of low carb salad, before I came up with Greek yogurt chicken salad, Mashed chickpea salad and Chinese green bean salad. According to me a good salad should have few properties. Firstly, it has to be simple and not loaded with calories. Secondly, it has to be healthy nutrient-rich. Finally, the ingredients should retain their own unique flavors. I have my own list of favorite salads from my favorite restaurants. I try repeat eating the same if fulfills my all criteria. Fresco salad from Chili’s restaurant is one of my favorite. Whenever I have this salad from the restaurant, I always plans to make my own soon at home. But when I made this time, I regret myself that I should have tried making it earlier. As this is that easy and astonishingly quick to make. Most importantly it was liked by my entire home. So without no doubt I’m going to make this often, as it is healthy as well. Importantly I want to disclose this Fresco salad is not a copycat salad from Chili’s restaurant but it is a similar one with a bold dressing. The salad I made today has to pair the grilled salmon. So Dijon mustard vinaigrette would be great to go with the seafood and the garden fresh spring mix. And this is also one of my tasty attempt to follow my low carb diet. The vinaigrette is so easy to make that you can make a well in advance and store it for two days. Store in it airtight container for best results. How long Fresco salad can last? This salad is best to serve immediately as soon as it is made. As the main ingredient spring mix can become soggy after a while. And this salad is not advisable to store the leftover. So decide the quantity before you make. I will not say this as an disadvantage as this recipe is so simple, that you can even make it over the dinner table. The spring mix greens are tender and soft. So it can not hold the vinaigrette for a longer time. Hence serve immediate as soon you made. This is a Mexican style fresh cheese. It is a creamy and mild cheese made with milk and the lemon mixture. This process of making is is similar to the cottage cheese of India(Paneer). Where both has all the goodness of milk nutrients. The garden fresh spring mix salad usually made with Qesco fresco cheese. A great side dish that is low calorie, low carb. 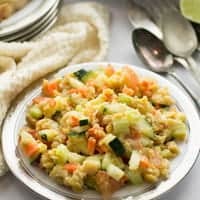 Can also be made with chopped cucumbers, carrots or other vegetables. Spring mixes: I usually go with Costco’s big bag of spring mixes which is crispy and great in taste. The spring mixes by itself looks great with the multiple colors and different layers. And this is the most important and main Ingredient so make sure it is fresh and crisp. Quesco Frisco cheese: This is another important ingredient. It is available in most of the groceries like Walmart. But you can make your own if it is not available near you. To make the Qusco Fresco, bring milk to boil and add two tablespoons of lemon juice. Now the milk start cuddles. Then strain it and this cuddled milk crumbles is the cheese that you need to make the salad. 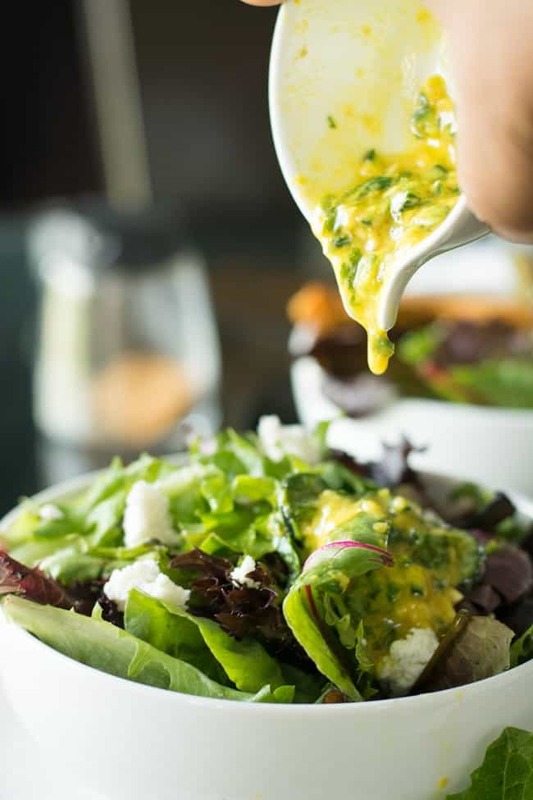 Mustard vinaigrette: Most of the ingredients for this vinaigrette are easily available in most of our pantry. I’m guessing you might also used to have this. 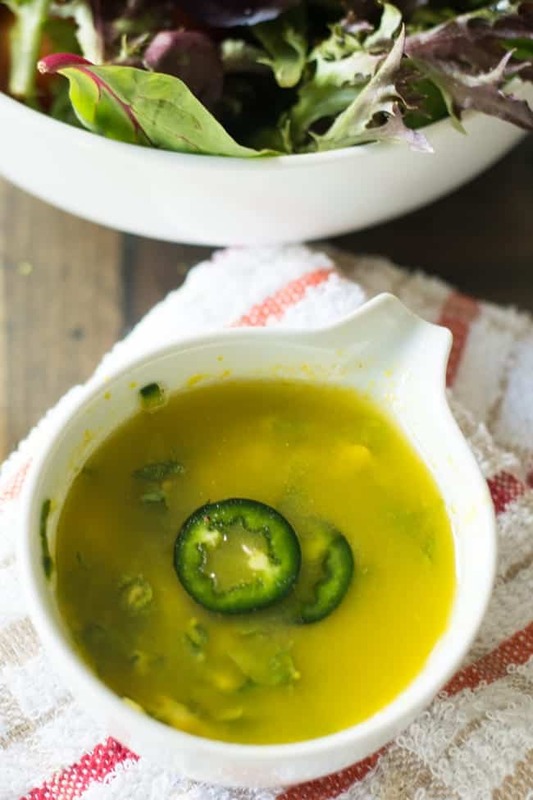 To make this fiery vinaigrette, you need is minced garlic, minced cilantro leaves, Dijon mustard sauce, lime juice and salt. The combination of this three ingredients are lovely and could make a wonderful winning dish, that is great for any Grilled seafood. This Fresco salad can also be made with fresh cucumbers, carrots, tomatoes. The choice of vegetables are up to you to decide. But today I’m just making something similar to what I had in the Chili’s restaurant. Why Dijon lemon vinaigrette for this salad? Dion mustard vinaigrette is perfectly bridge the taste between grilled food. The strong flavors of Dijon mustard sauce will turn amazingly when added olive oil and lemon juice. This combinations of flavors would be a great companion for any grilled dishes. You may add honey to make this fresco salad mildly sweet. You may add garden fresh vegetables like diced carrots cook burgers tomato onion. To add garlic powder instead of minced garlic. I would suggest you to add fresh garlic as this would give you a wholesome bold flavor of the garlic. But it can be substituted with garlic powder. This is a great option to make the preparation easier or if you’re running out of time. You may also add a tablespoon of ranch or Mayo to make a creamy mustard vinaigrette. 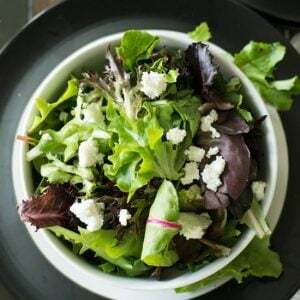 Fresco salad is a Mexican style fresh salad made with fresh spring mixes, Queso fresco(Mexican Cheese), and with mustard vinaigrette. This mustard vinaigrette is fiery and balances the crispiness of the spring mixes and the grilled food. In a small mixing bowl add minced garlic, minced jalapeno, minced cilantro, cumin powder, salt, Dijon mustard, olive oil. Whisk until it turns into smooth consistency. Keep aside. In a mixing bowl, add spring mix greens, the mustard vinaigrette. Toss gently until the vinaigrette coats evenly. Sprinkle Quesco fresco and serve immediately.